I participated in the Mom Blog Tour at the Summer Fancy Food Show on behalf of Wendy's Bloggers and received Saffron Road products to facilitate my review. All opinions and recipes are my own. Whenever I get the chance, I try to eat clean, healthy meals. The simpler they are, the better. This is why finding amazing products, like those from Saffron Road Food, is so wonderful. I was able to sample several Saffron Road products at the Summer Fancy Food Show. They have products like crunchy chickpeas, frozen foods (Chicken Biryani is my favorite and their chicken nuggets taste great and are gluten-free and antibiotic-free), and simmer sauces. 1. Prepare the quinoa according to package instructions. 2. In the meantime, heat the oil in a skillet and cook the chicken, flipping occasionally, for about 4 minutes or until the outside is white. 3. Add in the zucchini and yellow summer squash and cook another 7 minutes or until cooked through and lightly brown, stirring occasionally. 4. Reduce heat and add in the tomatoes and simmer sauce. Stir then simmer until the sauce is heated and begins bubbling lightly. 5. Serve over a bed of quinoa. Quick and easy dish with a refreshing flavor. Prepare the quinoa according to package instructions. In the meantime, heat the oil in a skillet and cook the chicken, flipping occasionally, for about 4 minutes or until the outside is white. Add in the zucchini and yellow summer squash and cook another 7 minutes or until cooked through and lightly brown, stirring occasionally. Reduce heat and add in the tomatoes and simmer sauce. Stir then simmer until the sauce is heated and begins bubbling lightly. Serve over a bed of quinoa. As I mentioned before, Saffron Road has many great products. I’m looking forward to purchasing more of the frozen dinners (I am currently in search of the chicken nuggets for my kids–they will be a much better choice for my Chicken Nugget Gourmet Series recipes.) They also have a wide variety of sauces with flavors from countries all over the world. I also really enjoy the crunchy chickpeas. They make a great snack for on the go. In fact, I snacked on them during my travels to and from the Fancy Food Show. They were a little bit messy from all the powdered flavoring, but they taste great and I love all the unique flavors. My kids and I really like the Chipotle flavor. The Wasabi flavor reminds me of Wasabi Peas and has a nice bite to it. Falafel is yummy too and a great option if you don’t like as much of a spiciness. 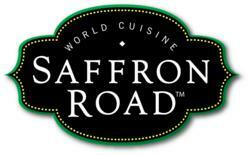 Follow Saffron Road Food on Facebook, Twitter, and Pinterest. -Which Saffron Road product do you want to try first? chicken, food, gluten-free, Mom Blog Tour, quinoa, recipe, review, Saffron Road, zucchini. Bookmark. I have seen their products in my local Kroger but have never tried them! They look amazing! Especially with your recipe – I will have to give them a try! I love trying flavors from different parts of the world. Will have to give these a try. The simmer sauces look awesome! I’ve tried a few of the simmer sauces and want to try more of the flavors. They are tasty!! I want to try the Lemongrass Basil the most! I would love to try the Chipotle Crunchy Chickpeas. They look tasty. I think the Korean bbq chickpeas sound yummy! The chickpeas! They look like a delicious and healthy snack! I’d love to try the chicpeas! I really want to try the Moroccan Tajine sauce. I have a friend in Morocco who was telling about tajines… and it sounds so wonderful. I would like to try the crunchy chick peas. I’d like to try the Korma Simmer Sauce! I have not seen that flavor at my stores! Love Saffron Road! So nice to find delicious gluten free food that isn’t bland! Whenever I take a frozen Saffron Road meal to work and heat it for dinner, people are drawn to the breakroom wondering what smells so good! Ehrm… forgot to mention I can’t wait to try the sauces. Derp!